Arthur, Paul, “The Western Edge: Oil of L.A. and the Machined Image,” pp. 8-28. Carroll, Noel, “Amy Taubin’s Bag,” pp.68-78. Davidson, David, “Warren Sonbert’s Noblesse Oblige,” pp. 109-12. Gunning, Tom, “The Critique of Seeing with One’s Own Eyes: Ernie Gehr’s Untitled (1976),” pp. 134-36. 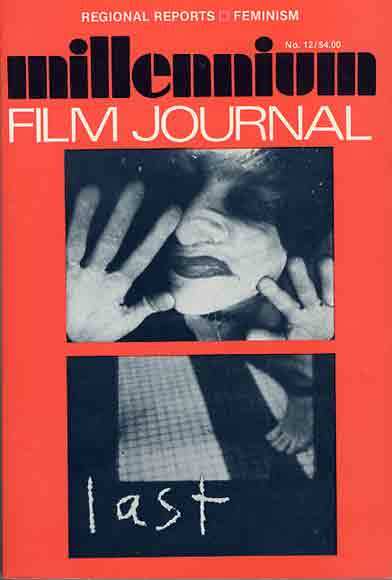 Hanlon, Lindley, “Female Rage: The Films of Su Friedrich,” pp. 79-86. Jamieson, Dale, “Rocky Mountain Formalism: Avant-Garde Film in Colorado,” pp. 29-35. Jordan, Larry, “Survival in the Independent Non-Commercial Avant-Garde Experimental Personal Expressionist Film Market of 1982,” pp. 5-7. Kaplan, E. Ann, “Appropriating the Heroine: An Analysis of Mulvey’s and Wollen’s Amy,” pp. 87-96. Kaplan, E. Ann, “Theories and Strategies of the Feminist Documentary,” pp. 44-67. Larson, Ernest, “The Last Days of Pompeii: Louis Hock’s Southern California,” pp. 131-33. Liebman, Stuart, “The Presents of Michael Snow,” pp. 97-108. Nosowitz, Harvey, “View of Chicago,” pp. 36-43. Pipolo, Tony, “Anita Thacher’s Sea Travels,” pp. 121-25. Schenkel, Thelma, “The Man Who Could See Far,” pp. 113-20. Vaughan, David, “Channels/Inserts: Cunningham and Atlas (Continued),” pp. 126-30.